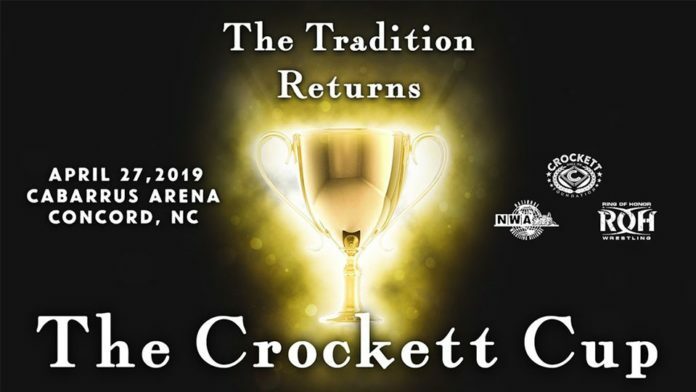 The NWA has announced the brackets for their upcoming Crockett Cup tournament. The one-night tournament will take place on April 27th from Concord, North Carolina’s Cabarrus Arena. Flip Gordon & Bandido vs Stuka Jr. & Guerrero Maya Jr.
** A wild card battle royal will be held before the tournament kicks off with the winners facing the War Kings in the 1st round. The promotion announced at their 70th Anniversary show last year that they would bring back the famed tournament from the mid-80s this spring. This will be the 4th edition of the tournament with the previous 3 having been held between 1986 and 1988.